Dictionary.com defines Terrorism as; the use of violence and threats to intimidate or coerce, especially for political purposes. Terrorism-Research.com says; Terrorism is not new and even though it has been used since the early times of recorded history, it can be relatively hard to define terrorism. Terrorism has been described variously as both a tactic and strategy; a crime and a holy duty; a justified reaction to oppression and an inexcusable abomination. Obviously, a lot depends on whose point of view is being represented. Terrorism has often been an effective tactic for the weaker side in a conflict. As an asymmetric form of conflict, it confers coercive power with many of the advantages of military force at a fraction of the cost. Due to the secretive nature and small size of terrorist organizations, they often offer opponents no clear organization to defend against or to deter. 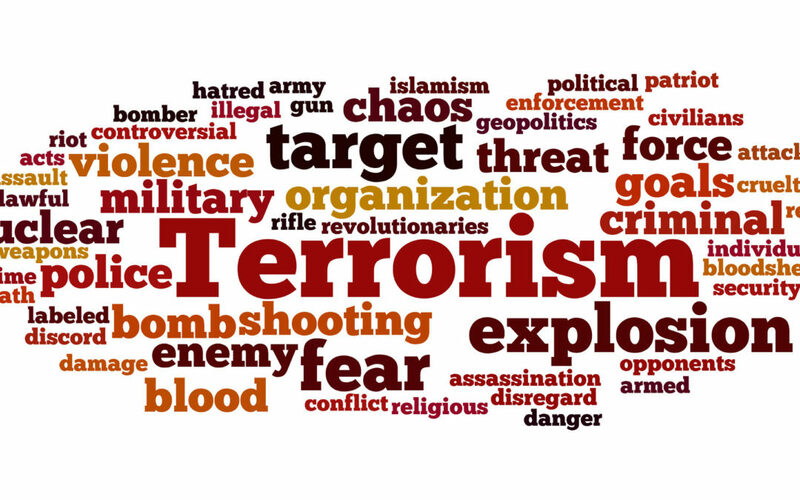 This will be one man’s attempt to define his beliefs on what today’s types of terrorism and terrorism definitions are. The first question is, what are the types of Terrorism we have today? This will not be your normal elitist response. First, Terrorism can be anything or anyone that tries to impose their will on you through brute strength or fear. The latter is usually the case. Fear is how a relative few can control the masses. If we look through the history books we see it happening again and again. Things we sometimes don’t see as terrorism actually are. How did Hitler control all the lands he held during World War Two? People feared the SS and the Gestapo. These thugs would come in and mutilate people at random, sometimes just to keep the public in line. The Japanese were no different. If that isn’t a couple of types of terrorism, what is? Why do you think ISIS beheads people even of their own faith? Not only do they behead people, but they make sure the cameras are rolling. Why? Beheadings put fear in the ones who are close in proximity to the beheadings. The internet allows that to reach a whole new level. Now they can reach millions of people who they can make quake in fear. Suicide bombers do relatively little collateral damage in the scheme of things. It is the emotional damage that people feel from far away that creates the terror that lasts and grows. Terrorist’s minor goal is to kill and maim, while their major goal is to control through fear. What would your grandfathers, who fought for your freedom, say about the way we are burying our collective heads in the sand and hoping it won’t happen to someone in our family? Why do we have to wait until another 9/11 happens? For those of you who think we can negotiate with them I have a question. How do you negotiate with someone who hates you? Have you ever tried that in real life? Not much fun, is it? Cyber terrorism is growing by leaps and bounds every day, but I am not even going to get into that. Look at the way Terrorism has changed our lives already. You doubt me? Look around you, what is the difference between now and the 1970’s? In the 70’s almost everyone knew their neighbors. Do you know yours? If so, how many do you know? Today we are so filled with our own life we forget about community and how important it can be. Think about it, if you don’t know who lives around you, how can you be sure you and children are safe? Is that why we don’t let our kids go out and play around the neighborhood like we did in the 70’s? Or is it that we are afraid someone from the “politically correct police” will call social services on us? Aren’t both of them forms of terrorism? Some are soft forms of terrorism, but in my mind, terrorism just the same. What about the gangs and violence they cause in the major cities? Isn’t that a type of terrorism? Look at the good, hard working inner city people who are forced to lock themselves in their own home for fear of going outside. Some of these places are worse than a war zone. It is not even safe in your own home. Don’t try and say I don’t know about the inner city. I grew up in and around the Detroit area in the 60’s and 70’s. From 6 Mile and Woodward Avenue, to 8 Mile and Livernois Avenue, to the suburbs of Garden City and Ferndale, I am a Detroiter. I grew up on those streets. What about protesters who demolish police cars and businesses because someone said or did something they didn’t like? You think they are justified? According to dictionary.com they are all acts of terrorism. Don’t get me wrong, I believe everyone has the right to protest. The First Amendment gives us that right. The First Amendment does not give us the right to destroy someone else’s property. Dr. King taught us that PEACEFUL demonstrations and protests work whenever they are applied. Even when it is against tyrants that use cruel and unusual ways to try and stop it, he still used peaceful ways to protest and did not fight back with anything other than words and deeds. As I look back to the Civil Rights Movement of the 60’s, the roles seem to have been reversed. The Civil Rights Movement was a peaceful movement and the authorities trying to stop them were the tyrants and terrorists. Now, it seems the protesters are the ones who are the terrorists. If they don’t get their way they riot and loot. Until we stop this, it will continue on all fronts. When I say we, I mean you and I. How, do you ask? Call your Congressman, your Governor, your Senator, and your Mayor and tell them you are sick and tired of paying for thugs and criminals destroying public and private property. Tell them if they don’t do something about it, you will vote in someone who will. If enough of us do that, then maybe it will change. You can read excerpts from the book there also. Nuclear Countries, Terrorism, Fact or Fantasy?